My son and I just recently finished reading Harry Potter and the Goblet of Fire. I have to admit that, considering the book is several hundred pages longer than its three predecessors, I wasn’t quite sure what was filling up all those pages. It got good – very good – at the end, but I can’t help feeling that it was, compared to Harry Potter and the Philosopher’s Stone, Harry Potter and the Chamber of Secrets and Harry Potter and the Prisoner of Azkaban, it felt somewhat bland. Other than a whole lot of prepubescent love interest, nothing really happened. We may not read the rest of the books for a while. Goblet of Fire noticeably takes a turn into darkness, and I’m not sure if we’re ready for that (ironic, considering the nature of the story I’m writing for him). Nonetheless, we enjoyed it, finished it, and moved on. We’re revisiting The BFG at the moment (which is pretty darn dark in its own way!). Another ritual he and I have is Friday movie nights. Netflix has become an invaluable instrument in our weekly film fix, and we’ve watched anything from the awful Jackie Chan movie Spy Next Door to the slightly better The Accidental Spy, among others. This week we watched The Dark Crystal for the first time. I had not seen it before, and I must say, I was swept away by the story, the beauty and the sheer dedication of the animatics in the movie. It was made in 1982, and puts Team America: World Police to shame. In more ways than one. Before that, we watched another Jim Henson masterpiece; one that I remember well from my own childhood: Labyrinth. Does anyone remember a terribly young Jennifer Connelly and a terribly camp David Bowie? Must have been heaven for her, I’m sure! It was a real treat to visit this surreal, acid-trip vision of my youth, and I couldn’t help pausing the movie from time to time to point out particular things to my son. Imagine having to explain David Bowie. Whew. In the proceedings, I noticed a few other things as well. Things that rang a bell from elsewhere. As you may have noticed at the head of the post, I have placed side by side (top by bottom?) a still from Harry Potter and the Goblet of Fire and Labyrinth. Does anyone see a resemblance? 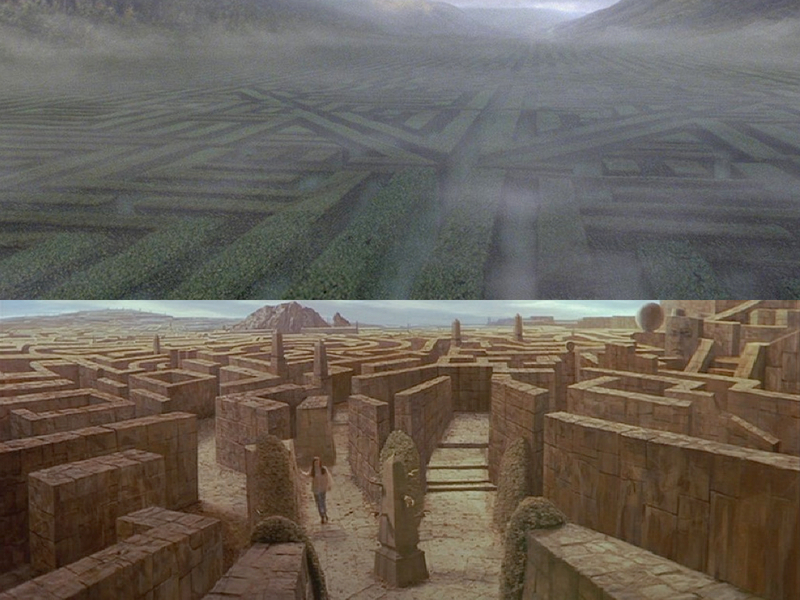 Now, surely mazes aren’t particularly uncommon – there’ve been plenty of movies and stories that have featured them, The Shining and Alice in Wonderland amongst others. Both of these predate Labyrinth and Harry Potter. In truth, at first I didn’t even see any connection. But then, a couple of other things happened. Remember Hoggle? A grumpy, self-depricating and ultimately heroic little dwarf who guides Sarah through the maze. When we are first introduced to him, Sarah in her distraction mistakenly calls him Hogwart. Hogwart – really? This was the first coincidence I picked up on, and pointed it out in laughter – imagine they both came up with the same name! A little later, my suspicions were raised. 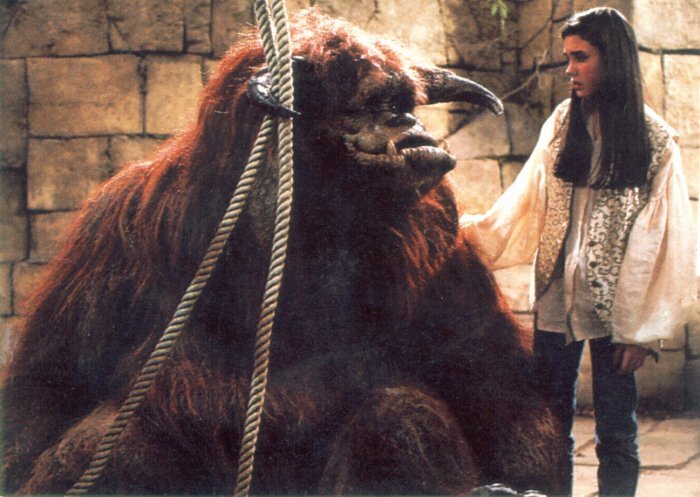 Remember the big, hairy, somewhat dimwitted monster that befriends Sarah and has some bizarre power to control rocks? Name’s Ludo. Yes, Ludo. Just like Ludo Bagman, the Head of the Department of Magical Games and Sports. Anyway, it turns out I’m not the first one to think of this, as a quick Google search will tell you. Some people see the coincidences; some dismiss them. I don’t necessarily want to make a claim either way, but just bring it to your attention: what do you think? History is always repeating itself, even in literarure and films. But, even though I enjoyed the Potter series, I recognised many instances where Rowling was using formulas. Potter was a commercial enterprise, but delightful escapism. I used to read the books to Dom. Beware of the Death Eaters in coming books, they’re a darkness that still invade my nightmares, I think I would be wary for your son. Perhaps not quite the darkness you would like him to embrace just yet. Love the image of a dad trying to explain Bowie to his young son, try Kiss, or Adam Ant next! I haven’t seen any of the films, though I understand the Deathly Hallows gets pretty grim. I don’t particularly try to protect him from scary things, but I do respect most film ratings, and most of the films after Prisoner of Azkaban get PG-13 (he’s eight). I have a feeling I’ll be reading them first (not that I mind that at all!). Yeah, They’re easy, good fun. And I adore Snape, the character and Alan Rickman’s portrayal, particularly in the early films when he looked more emaciated and evil!! There’s such a depth and sadness behind the nastiness, and I feel like we’ll only learn more about it as the story goes on! If he’s only eight, then he’s probably not ready for anything after Goblet of Fire yet. The stories are really dark, and like someone else just said, the Death Eaters and dementors would be terrifying. How did he take those dementors? He wasn’t too bad; no nightmares or anything. I probably will hold off anyway, though. He got so scared of the ghost of Marley in A Christmas Carol last year that we had to stop! Wow. I’m only twenty, and I already can’t remember what I was like when I was eight. -.-‘ Is he enjoying Brandye’s story as much as we all are? He very much is, though he says the slow parts are “a bit boring”! I’d have little ability to remember my life at eight, if I didn’t have him to remind me. And that’s not always a good thing, by the way. That particular scene feels like an acid trip. Love it.